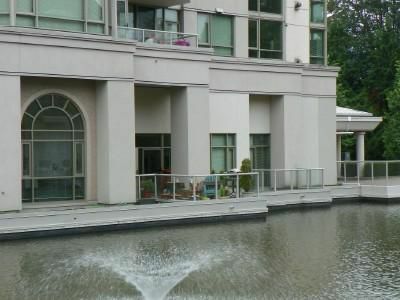 Waterfront in the heart of Coquitlam Centre! Unique floor plan with very private setting for this ground floor home.Huge patio on the lagoon is great for barbecues or just relaxing.2 bedrooms, 2 bathrooms, updated laminate flooring and paint. New floor tile in kitchen and both bathrooms. Floor to ceiling windows throughout. Living room is breathtaking with 14' ceiling and huge sunrise window overlooking the lagoon. Only steps to great amenities (pool, sauna and well equipped gymn). Walk to Coquitlam Centre, all levels of school (including Douglas College) and all levels of transit (including West Coast Express and the anticipated Evergreen line).Shows great!Quick possession is possible.Maintenance fee includes basic cablevision.